When Fantastic Beasts and Where to Find Them was first discussed as a movie, it was intended to be a standalone spin-off based on a text book used within the Harry Potter universe with scholar Newt Scamander at its center. Before long, it became a trilogy, and then just a few weeks ago it was announced as a 5 film epic. While that might seem like overkill to some who have yet to see the first Fantastic Beasts and Where to Find Them, it appears there's a perfectly good reason why this fantasy adventure is becoming so wide ranging. And the same man will be in control of all of it. 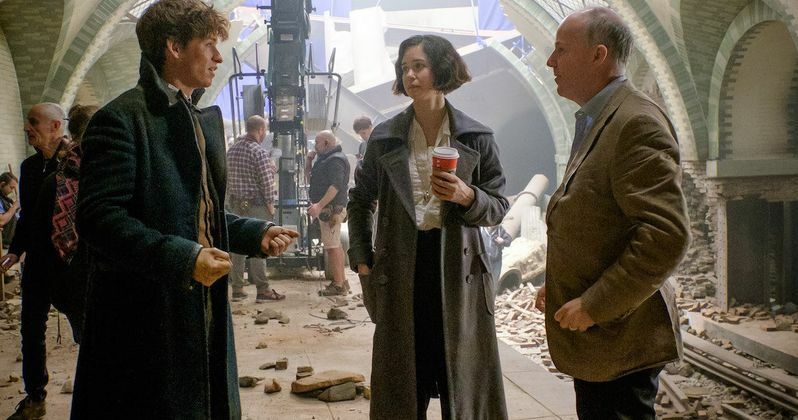 Yes, David Yates, who directed four Harry Potter movies including the 2-Part finale The Deathly Hallows and the first Fantastic Beasts movie, will be back to direct the next four sequels as well. The Hollywood Report goes onto confirm that J.K. Rowling will pen every one of these scripts. The movie series stars Eddie Redmayne as magizoologist Newt Scamander, who unwittingly unleashes severely dangerous creatures on New York City back in 1926. The first Fantastic Beasts movie is in theaters this coming weekend, November 18, and it is projected to earn $70M+ during its first three days of release, though it is also suspected to be the lowest earning Harry Potter opener in the franchise. The movie has quite the ensemble cast, with Katherine Waterston, Ezra Miller, Colin Farrell, Ron Perlman, Alison Sudol, Carmen Ejogo and Dan Fogler all playing key roles in this earlier version of the Harry Potter Universe. About taking on all 5 movies, Yates said this. "I love making films, and I've got a great team, all of whom are like family. I only look at it movie to movie." J.K. Rowling created the Harry Potter universe with a series of best selling books that soon became blockbuster movies. Fantastic Beasts is her first-ever screenplay. And she already has the script for Fantastic Beasts 2 done. She's currently in the process of putting the finishing touches on it. The movie will take place in Paris and the U.K. But it's quite a bit different from this first offering, with the sequel set to return Dumbledore to the big screen. Says Yates about the next movie in this spin-off franchise. "[Fantastic Beasts 2] feels so different from this [first film]. Much more haunting, like a dream. What she's doing is really interesting; she's not repeating herself." David Yates is already in preproduction on Fantastic Beasts 2. And sets are already being built that depict areas of Paris, France and Watford, England. Johnny Depp, who has a small cameo role in Fantastic Beasts will be back with a much larger role in the next sequel, playing the dark wizard Grindelwald, friend and lover of Dumbledore who becomes his rival. The movie will span 19 years, ending in 1946, when the great duel between Grindelwald and Dumbledore took place. J.K. Rowling discovered that the hardest part about writing a film franchise was having to come up with the entire story altogether. She says this about no longer being intimidated by the process. "I'm never complacent. I'm always feeling like I gotta do my best work, and I'm always pretty hard on myself. We've set ourselves an ambitious story to tell in five movies, but it's going to be challenging and exciting - all the things I like." It's noted that the Fantastic Beasts that is hitting screens this coming weekend is actually directed from the third draft of the screenplay. Plenty of changes were made from the first draft to the last. Says Yates about the story as it first started to take shape as a movie. "The first draft was quite whimsical and lyrical, but it felt it didn't have any heft and we weren't sure what it was about. Then Joe took a left turn and it was right up my street: it was really intense and dark. Joe and I loved it, but David Heyman and Steve Kloves very wisely said, 'Whoa, hang on guys, this needs to get some of the lightness back.' It was after that dark second draft that Joe suddenly found the melody; then, she was away to the races. It was a struggle to keep up with her because she knew what it was: a balance between light and shade." It won't be long before audiences are back in the Harry Potter universe. Though the first movie isn't tracking to be as huge as some of the Harry Potter movies, it is quite anticipated, and Warner Bros. expects it to be a series that grows with each installment. There is plenty to be excited about in this first movie, as it opens up a whole new side of the Harry Potter universe. Tickets are on sale now, with the first screenings taking place Thursday night during special early previews across the country.